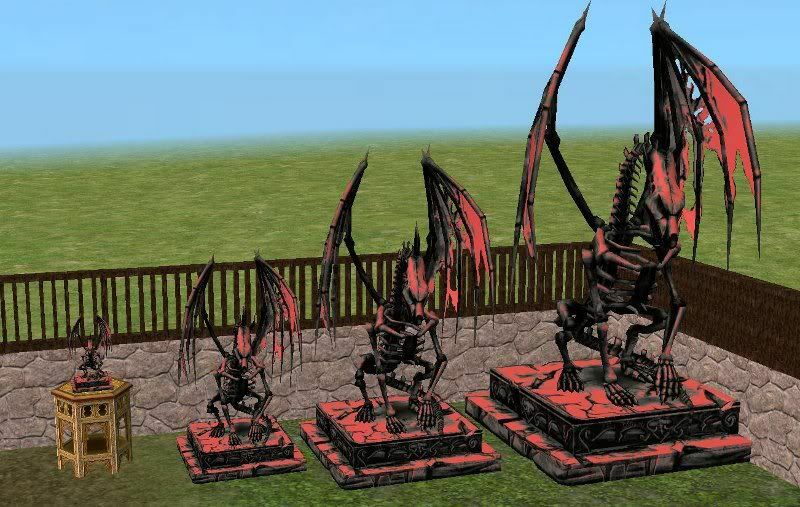 This is The Sims Medieval Dragon Skeleton sculpture for The Sims 2. All of the smaller statues are repository linked from the largest one. This means that any recolors of the larger one that you have in your downloads folder will show up in the smaller ones as well. It also means that the smaller ones are not recolorable, instead you should recolor the larger statue. The table sized statue is enabled as a functional centerpiece. You can also download the half wall here. The mesh is slightly lower poly count than the Sims Medieval mesh. I really don't like creating for TS3. That game has caused me nothing but disappointment and sadness plus I really much prefer the whole looks and feel of ts2 better. I hope it's ok if I recolour it though? I have the original texture and I'd love to have it in my game. Please make this for the Sims 3 and also the knight statue. Plz, plz I love your conversions so much. Plzz, I beg you !!!! Fantastic work :) But it seems to be deleted from box.net? Could I please some reupload? Box.net apparently still can't find the file, can you please reupload?